BAGHDAD - Defense Secretary Leon E. Panetta said yesterday that weapons he said were supplied by Iran had become a “tremendous concern’’ for the United States in recent weeks in Iraq, where more American troops died in June than in any month during the three previous years. “We’re seeing more of those weapons going in from Iran, and they’ve really hurt us,’’ Panetta said before arriving here on an unannounced trip, his first to the Iraqi capital as defense secretary. Panetta is the third top American official to raise an alarm about Iranian influence in Iraq in recent days. The US ambassador to Iraq, James F. Jeffrey, recently said that the United States had “forensic proof’’ that weapons and weapons parts from Iran were being used by Shi’ite militias against US troops. His remarks were echoed by Admiral Mike Mullen, the chairman of the Joint Chiefs of Staff. Panetta’s comments, made a day before he is to meet with the Iraqi prime minister, Nouri al-Maliki, were aimed at urging the Iraqi military to take more action against Shi’ite militias and to see Iran as the Obama administration does - not just as a threat to US troops, but as a potential cancer in a future Iraq. “The key right now is to make sure that we do everything possible to ensure that the Iraqis within their own country are doing what they can to stop the flow of those weapons and to stop the Shia from using them,’’ Panetta said. US officials said that Iran supplies the militias with high-powered rockets and parts for powerful bombs that can pierce armor. In June, 15 US troops were killed in Iraq, nine of them in high-powered rocket attacks, US officials said. That was the highest US death toll for any month during the past two years. Panetta is in Iraq as all 46,000 remaining American troops are withdrawing this year under an agreement between the two countries. Both Iraqi and American military commanders believe that some American forces should stay beyond the end of the year, but few Iraqi politicians are willing to admit publicly that they need US help. Obama administration officials say they will consider staying only if the Iraqis ask. In April, Robert M. Gates, Panetta’s predecessor as defense secretary, all but begged the Iraqis to ask and said time was running out. Three months later the situation is largely unchanged, although the Iraqis appear to be making some moves toward making a decision. Yesterday, Panetta echoed Gates. “If they are to make a proposal with regards to a continuing US presence there, they have to make a formal request - that we would obviously consider,’’ he said. Panetta was a member of the Iraq Study Group, created by Congress in 2006 to consider a better strategy for the war, which was spiraling out of control at the time. Also yesterday, the United States opened a consulate in Iraq’s Kurdish region, which will try to attract more American investors to one of the most stable and fastest-growing regions in the country, the Associated Press reported. Although it is in a relatively safe Christian neighborhood in the Kurdish capital of Irbil, the consulate is protected by blast walls. The Kurdish region in northern Iraq was largely untouched by sectarian fighting that almost drew the country into civil war several years ago. The opening of the consulate in Irbil comes more than eight years after the US-led invasion that toppled Saddam Hussein but left much of Iraq shell-shocked and in turmoil. The consulate in Irbil will largely assist US companies looking to invest. To coincide with the opening of the consulate, Marriott International signed an agreement with Kurdish officials for a 200-room hotel and 75 executive apartments in Irbil in three years. 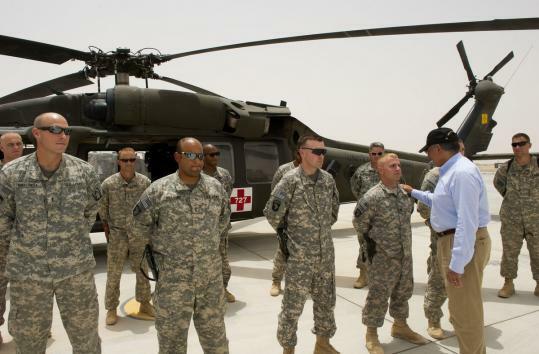 Panetta arrived in Baghdad from Helmand Province in Afghanistan, where he met with US Marines and Afghan army soldiers at Camp Dwyer, a sprawling military base and the site of a busy medevac hospital in the southern desert. Panetta said he was encouraged by what he saw. “I think the bottom line is we are on the right path here,’’ he said. In Washington, Obama administration officials frequently cite military gains in the provinces of Helmand and Kandahar as evidence that the Taliban have largely been driven from the south. But Marine commanders offered a more complex assessment. “The war is certainly not over here,’’ said Brigadier General Lewis Craparotta, a senior commander of the 20,000 Marines in Helmand Province. Craparotta said that although the Taliban had not come back with the same strength in this summer’s fighting season as last year, Marines were still taking direct fire and were under threat from homemade bombs every day, particularly in areas like Sangin and north toward the Kajaki Dam.